Culturally Relevant Teaching: How Do We Create Equitable Learning Environments? Students enter the classroom with their own specific learning needs, styles, abilities, and preferences. They also bring with them their own cultures, backgrounds, and personal histories. In culturally responsive classrooms, teachers make standards-based content and curricula accessible to students and teach in a way that students can understand from their varying cultural perspectives. If the goal is for each student to succeed academically, how are we using the cultural capital available in our classrooms to capture attentions, engage students, and make curricula relevant? On this episode of the Whole Child Podcast, Sean Slade, ASCD's director of whole child programs, and guests explore what it means to, as Gloria Ladson-Billings writes, "empower students intellectually, socially, emotionally, and politically by using cultural referents to impart knowledge, skills, and attitudes"; how to create a positive classroom learning community; and what supports teachers need to serve their diverse students. Paul Gorski is an associate professor in New Century College and research fellow in the Center for the Advancement of Well-Being at George Mason University in Fairfax, Virginia, and founder of EdChange. His work and passion is social justice activism and areas of scholarly focus include anti-poverty activism and education, economic justice, racial justice, environmental justice, and animal rights. Gorski's most recent book, coauthored with Seema Pothini, is Case Studies on Diversity and Social Justice Education. He is also the coauthor, with Katy Swalwell, of the March 2015 Educational Leadership article "Equity Literacy for All." Connect with Gorski on Twitter @pgorski. Andrew Miller has spent many years in education as a classroom teacher, online teacher, curriculum developer, instructional coach, teacher leader, and education consultant. He has used his skills in authentic intellectual work, online education, project-based learning, game-based learning/gamification, 21st century skills, and culturally responsive teaching to create engaging learning environments for all students. Miller currently serves as a faculty member for the Buck Institute for Education and ASCD. He is also an avid blogger and writes regularly for Inservice, Edutopia, and the Huffington Post on the subjects of student engagement, formative assessment, the Common Core State Standards, project-based learning, and technology integration. Connect with Miller on Twitter @betamiller. In a special one-on-one conversation, Slade spoke with Geneva Gay, an educational researcher who has contributed significantly to the progression of culturally relevant teaching. Gay is a professor of education at the University of Washington in Seattle, where she teaches multicultural education and general curriculum theory. She is nationally and internationally known for her scholarship in multicultural education, particularly as it relates to curriculum design, staff development, classroom instruction, and intersections of culture, race, ethnicity, teaching, and learning. She has written a number of books and book chapters, including the book Culturally Responsive Teaching: Theory, Research, and Practice, and is a member of the authorship team for the Scott Foresman New Elementary Social Studies Series. How can teachers make their classrooms and instruction safe and effective for students from a wide range of backgrounds? Flip Your Classroom: Reach Every Student in Every Class Every Day, in a free webinar to learn how the flipped classroom model can help teachers gain more face-to-face time with students, foster real differentiated or personalized learning, and challenge students to take responsibility for their learning. ASCD author Aaron Sams explains how flipped classrooms use class time to practice and apply skills learned during prerecorded lectures. Homework becomes classwork, and lectures and other content traditionally presented during class time are viewed outside of class, at home, on a personal device, or in a school-based resource room. 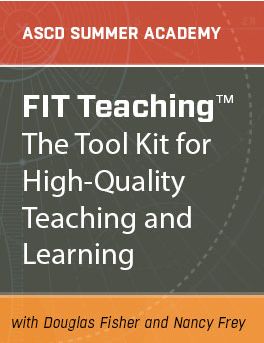 Get hands-on practice using the new FIT Teaching (Framework for Intentional and Targeted Teaching®) tool kit to help ensure high-quality teaching and learning. Join ASCD authors Douglas Fisher and Nancy Frey in a free webinar on June 4 to learn more. Personalization is quickly becoming a buzzword in education, especially in terms of blended learning and educational technology. I joined a team of educators on a panel on the same subject on the Whole Child Podcast. We unpacked what it is and what it might look like in the classroom. We talked about its challenges and benefits and collaborated to explain its implications for education. Most importantly, we talked about the critical role of relationships. Recently I was having a discussion with a colleague who is new to the building. This teacher is confident, self-assured, and has decades of experience more than me. We teach the same children, so we meet frequently for RTI and team meetings. This is the type of teacher that takes pride in being "old school," which roughly translates to a no-nonsense, quiet-equals-learning, behavior-should-have-negative-consequences type of environment. It's the model that many of us grew up with. Although I was able to navigate through this system because I was a so-called "good student," many friends were not particularly successful, with the logical assumption that they were "bad students." This model puts the system itself as the driving force for success, which is disempowering both to educators and to the students alike. Now, the conversation in question did not go smoothly, especially when I insensitively insisted that the teacher "would not be successful" using this old school approach. Realizing that I was working against my goal, I quickly concluded with a final statement that I paraphrased from a Maya Angelou quote: People don't remember what you say; they remember how you made them feel. It is a statement that I share with staff and students, and for me it is at the foundation of the type of teacher I strive to be. It is also at the core of the safe and supported tenets of the whole child approach.